At Lancashire Law we understand that, following the death of a loved one, you may need a professional to assist you in managing their affairs. We appreciate what a stressful time this is and aim to provide a professional and caring service at a very difficult time. 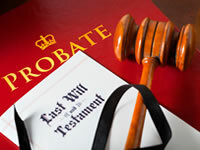 If there is a Will you may need to apply for a Grant of Probate in order to handle the deceased’s assets. If there is no Will you may need to apply for a Grant of Letters of Administration, which will then enable you to handle the deceased’s assets. We can offer a specialist fixed fee service and will guide you through this difficult time. The temptation to save money by administering ones own probate instead of seeking professional advice is high. However there may be unwanted complications and troublesome mistakes created by DIY probate. Lancashire Law makes the procedure as quick and easy as possible at affordable prices. We can offer you a fixed fee subject to assessing the extent of the estate. Lancashire Law Offers Various levels of service in assisting with obtaining a grant of probate. We can do as much or as little as you want. Please make a free appointment with us today so that we can assess which level of service is right for you. Unmarried - the law does not recognise unmarried couples so do not expect anything to go to you partner if you don not make a will! Change in Circumstances - update your will whenever you marry, have kids or divorce. DON'T DELAY - SPEAK TO ONE OF OUR SPECIALISTS TODAY! We offer a free initial consultation and will carry out home or hospital visits where necessary. We will provide advice at that meeting in relation to your Will and possibly other steps you can take to protect your assets from the Local Authority seeking payment in relation to residential accommodation and also your liability for Inheritance Tax.